I went to Jeff Wall’s show at White Cube unsure quite what to expect. At some point when I wasn’t paying attention, Wall left behind the elaborate tableaux and sometimes less than obvious references to the history of painting and started to tell different stories – somehow simultaneously simpler and more complex – through his photographs. The work here is from two separate bodies of work that feel in some ways as though they could have been made by two different people. 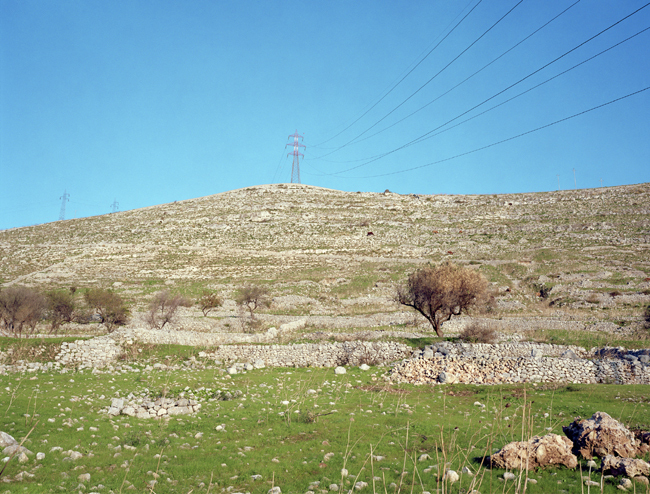 In the ground floor space there are three photographs of the Sicilian landscape. Described as ‘documentary pictures’ in the press release, these tell of a landscape fundamentally unchanged over time but one in which the modern world is nonetheless constant visual presence. The drystone walls in Hillside near Ragusa might have been there for centuries staying low to blend into their surroundings; man is not a recent incomer to this place. By contrast, the electricity pylons stride across the hillside with a confidence that its natural inhabitants – the short, windswept trees growing on the low ground – don’t seem to share. Downstairs things feel very different. Here the pictures are populated, and seem staged to a greater or lesser extent, though the stories they tell still seem to suggest an underlying truth. Here, the narrative comes in part from the pictures and in part from their titles which, whether in one word or many, describe the images in what seem at least to be factual terms. The precision of the title of Ivan Sayers, costume historian, lectures at the University Women’s Club, Vancouver, 7 December 2009. Virginia Newton-Moss wears a British ensemble c. 1910, from Sayers’ collection allows no space for speculation. The narrative of the lecture is played out in two planes. In the foreground, the costume historian and his model stand side by side in a setting more like a ballroom than a lecture hall. At first glance, they are all I see. But the audience are here too, reflections in the mirrored doors. They listen intently making the picture a dialogue between audience and speaker. The model – so poised and still I looked closely to check that she was real – seems simultaneously the focus of the picture and the most incongruous element within it. 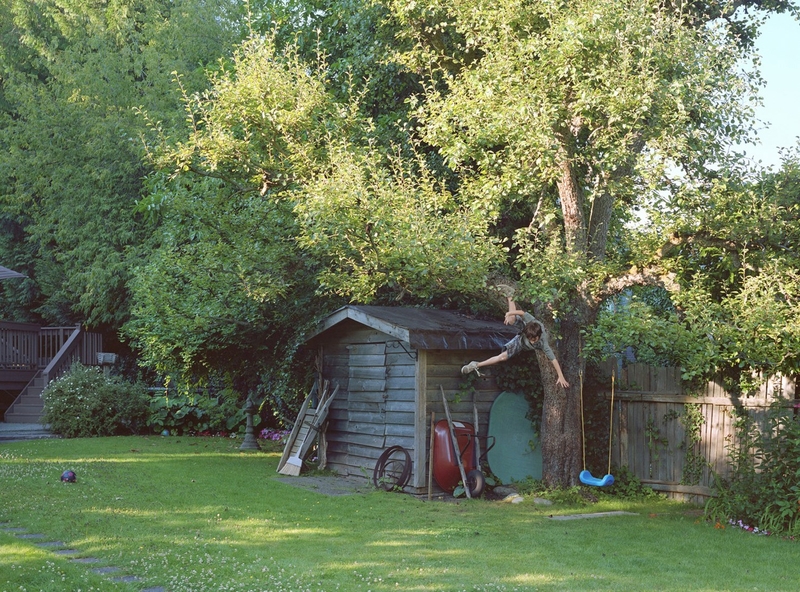 The picture here that feels the most natural and at the same time the most fictitious is Boy falls from tree. The fall looks convincing though it clearly can’t be. Ultimately, my assumption that this boy’s fall was staged and digitally constructed doesn’t make the picture feel any the less like a scene I recognise as ‘true’. Representation and reality can’t stay apart, they depend on one another too much. This entry was posted in Photography and tagged art, Jeff Wall, London, photography, White Cube by Ann Jones. Bookmark the permalink.